Pershing Square hosts the kinetic sculpture "Liquid Shard" - Archpaper.com Pershing Square hosts the kinetic sculpture "Liquid Shard"
Which is why you might be a bit surprised to learn that this week, Pershing Square is playing host to Liquid Shard, the latest collaborative public art project by L.A.-based artist Patrick Shearn of Poetic Kinetics. 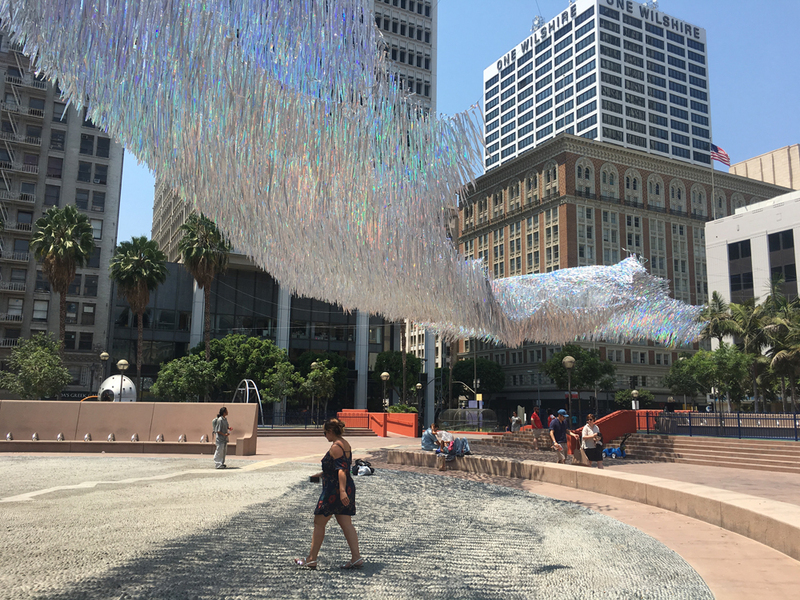 His work, a collaboration with students attending the Architectural Association Visiting School Los Angeles (AAVSLA) summer program, under the direction of Eulalia Moran and tutor Devin Gharakhanian of SuperArchitects, the City of Los Angeles Department of Recreation and Parks, and the arts organization NOW Art L.A., takes the shape of a mesmerizing, iridescent wind-activated sculpture. The 15,000 square foot installation is made of two layers of holographic mylar connected with monofilament that flitter in the wind, creating a dazzling and otherworldly atmosphere in the park. The installation’s layers, hovering between 15 and 115 feet above the square, give the impression of a million tiny things moving in unison. 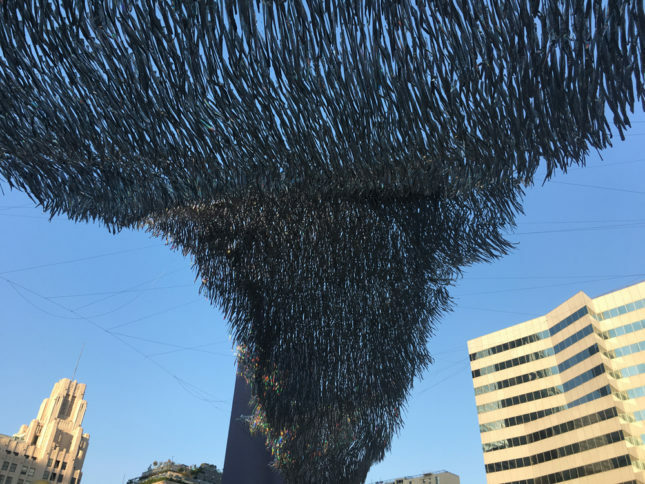 Shearn told AN over telephone that the inspiration for the piece came from murmuring, the swarm behavior schools of fish and flocks of birds engage in as they move in unison. Shearn, who is well-known on the music festival circuit as the artist behind the giant, fully animatronic astronaut sculpture showcased at the 2015 Coachella Music and Arts Festival in Coachella Valley, California, developed the installation with AAVS students as part of a summer seminar. 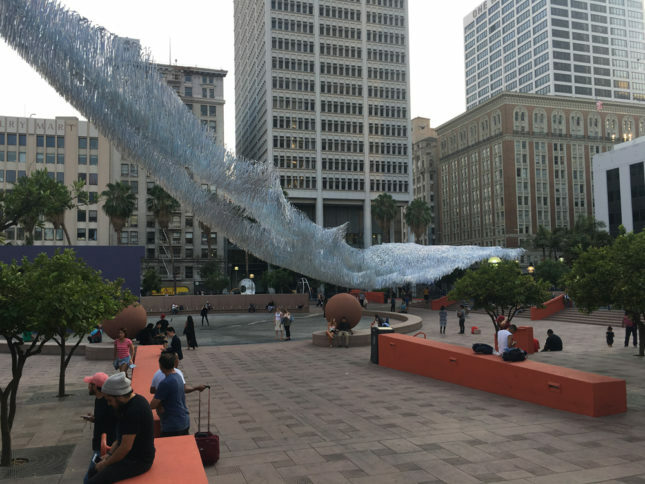 During the course, students produced their own versions of the installation, with the class coming together in the final weeks to work on a full-scale version developed by Shearn for Pershing Square. The project will be on view until at least August 11th, but potentially for longer.